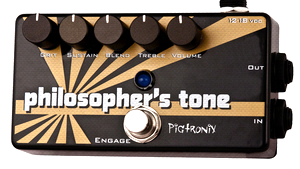 KitMonsters – Pigtronix Philosopher’s Tone. The music makers’ guide to making music. 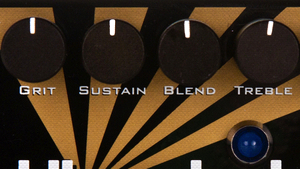 Analog compressor/sustainer with noiseless clean sustain that’s turning heads. It features blend, treble and even grit controls to give you plenty of clean sustain and a harmonic distortion for clean or dirty compression. You can mix the tones to get your personal favourite sound, and it’s designed to rock on its ownsome but also to work well with your other favourite effects. It’s got treble EQ and true bypass.